‘Early Dutch Explorers’ exhibition travels abroad. At the MyState Australian Wooden Boat Festival earlier this year, we produced a special exhibition marking 375 years since Abel Tasman and his crew on board the Heemskerck, visited the island that would one day carry his name. The exhibition, presented at the Tasmanian Museum and Art Gallery, was the result of an international collaboration between Dutch journalist Kaeren Meirik, Tasmanian graphic artist Julie Hawkins, New Zealand researcher Dave Horry and Tasmanian cartographer Henk Brolsma. Who would have thought then that this exhibition would travel on to both the Netherlands and New Zealand? We are delighted to see that this extraordinary story is of interest all over the world. At the Noordelijk Scheepvaartmuseum in Groningen everything is ready to open Dutch version of the exhibition of the exhibition that we mounted in TMAG some 9 months ago. It will open on November 24th, exactly 375 years after Abel Tasman first sighted the west coast of Tasmania. The English language version will be on display in New Zealand at the Maritime Museum in Auckland on the weekend of 2-4 December, 2017 and at the Golden Bay museum in Nelson at their commemoration of the First Encounter between Maori and Europeans. Author awbf_adminPosted on 21/11/2017 19/03/2018 Categories StoriesTags Abel Tasman, Australian Wooden Boat Festival, AWBF, Dutch, festival, Tasmania, wooden boatLeave a comment on ‘Early Dutch Explorers’ exhibition travels abroad. We are hoping that tall ship expeditions in the Southern Ocean will become more familiar, perhaps extending to adventure cruises to the sub-Antarctic islands and East Antarctica from Hobart. Now, wouldn’t that be something? Hobart’s growing reputation as an Antarctic gateway city might get us there. Once upon a time there was a log. 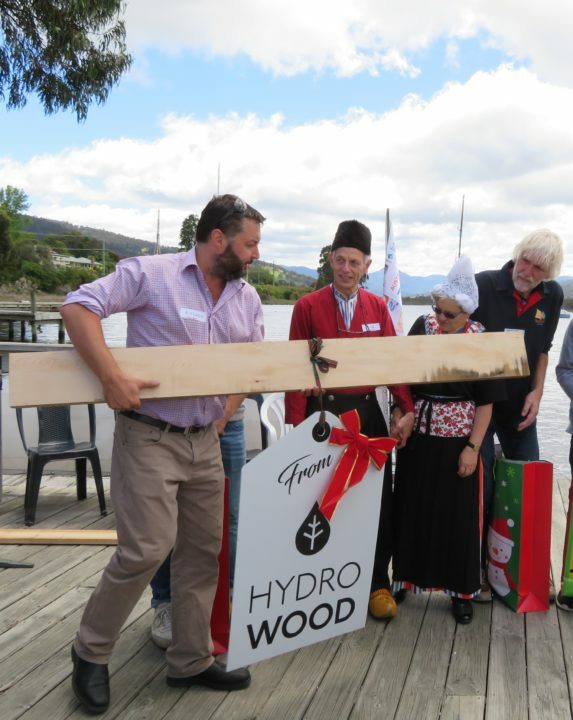 It was a very nice log of celery top pine and along with a slightly smaller log, it was donated by the clever people at Hydrowood, who are reclaiming valuable boat-building timber from the Tasmanian highland lakes. Here at the AWBF, someone said ‘Hey, free wood! 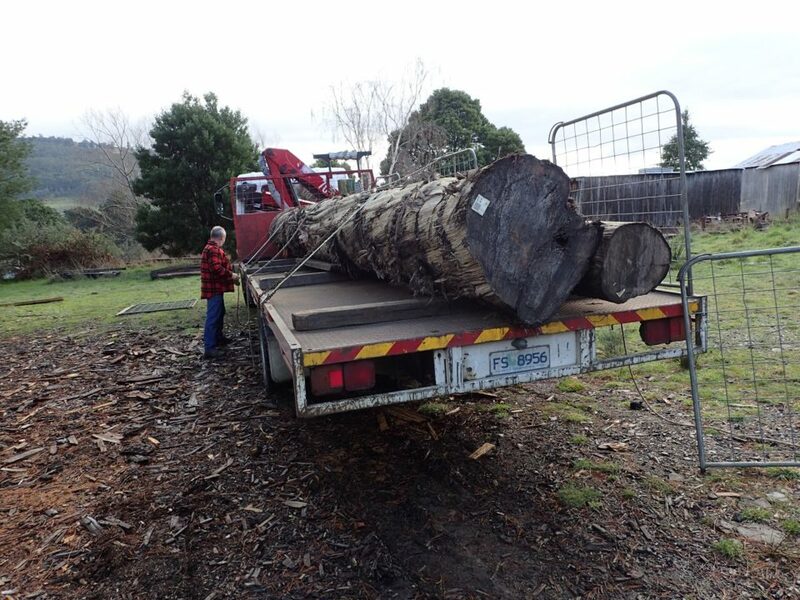 Those logs would make a great boat, wouldn’t they?’ So the log was milled by local wooden boat enthusiast Dave Golding and the lovely clean timber was brought to the Wooden Boat Centre at Franklin. 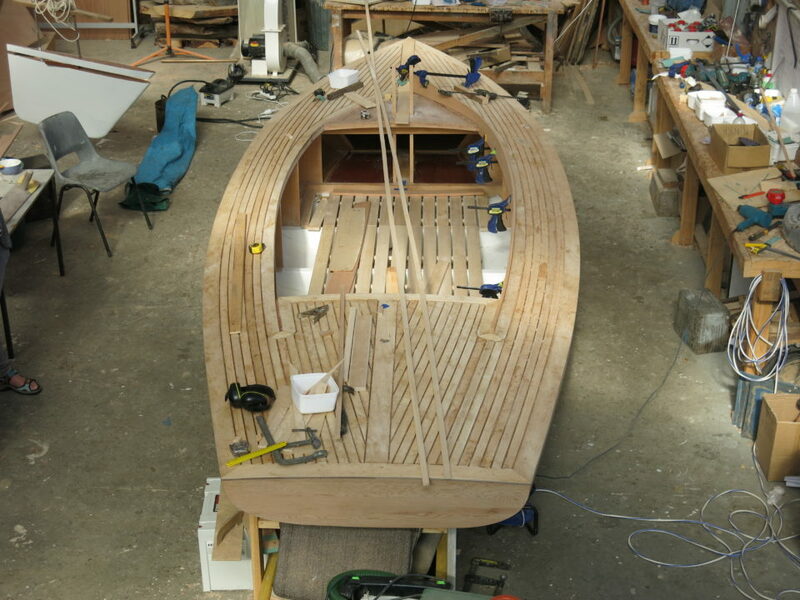 But of course if the timber was ever to be anything more than a stack of wood, we would need a team of boat builders to knock it into shape. We were lucky to find a team of six student shipwrights and their instructor who were willing to come out all the way out from Holland to build our boat. 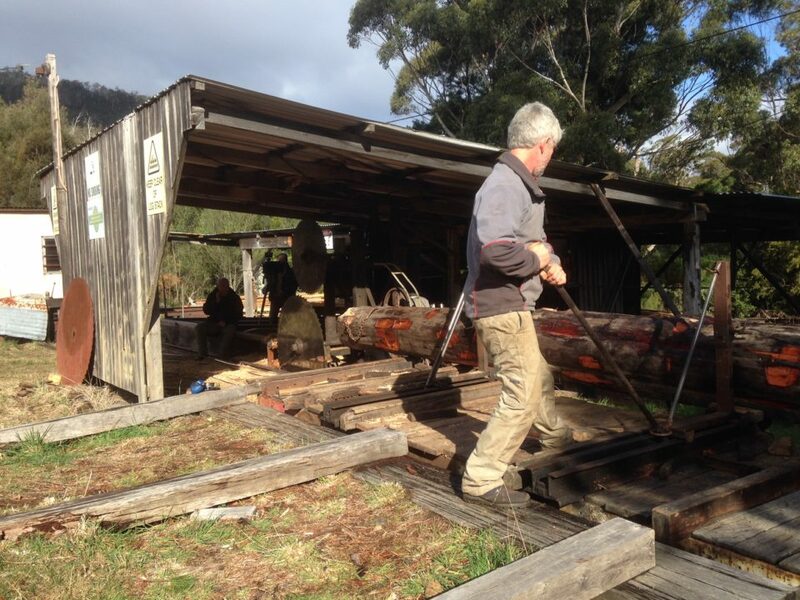 Well, they needed somewhere to stay and somewhere to build the boat, so the kind people in the town of Franklin helped to find them places to live and the Wooden Boat Centre gave them a workshop to build the boat in. Sure, the air fares and the accommodation and the tools and the extra materials and the transport all cost a few dollars, but hey, it was free wood and volunteer labour, right? And then one day, it was done! We had a beautiful Dutch-design sailboat called a BM16m2 and it was christened ‘Seacrest’. 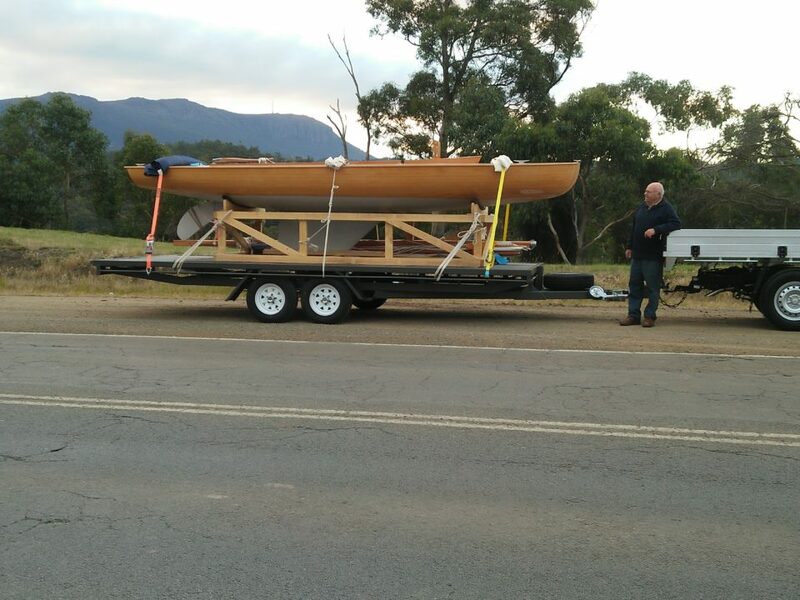 We hired a truck and a crane (oh, we had to build a cradle for it to sit in) and then we shipped it up to the MyState Australian Wooden Boat Festival, where it was a big hit and everyone admired it. In fact one man, a retired rock lobster fisherman from Victoria named Gerhard Wilmink, liked it so much that he pointed it out to his partner, Cherie. ‘Look, that’s a lovely boat and it’s up for auction today and I bet it will go for a good price and wouldn’t the grandchildren love it?’ (If you have ever watched a patient partner listen to the ravings of a wooden boat lover, you can imagine the eye-rolling and the resigned expression). Gerhard bid carefully in a lively auction and soon the boat was his! But, of course it would need a final coat or two of varnish, so it was back to the Wooden Boat Centre for a little more loving, while Gerhard sorted out a a very sturdy twin-axle trailer to transport the boat back to Apollo Bay in Victoria (and yes, the fares on the Spirit of Tasmania can make your eyes water). Soon, it was ready to go. But as it happened, the boat and the trailer were a little too much for Gerhard’s car, so he had to go out and buy a new truck to tow it. Which is the story of how a couple of free logs turned into Seacrest, a Cinderella of a sailboat, ready for the warmer weather and some excited grand-kids to go sailing. Of course, we are teasing a little. 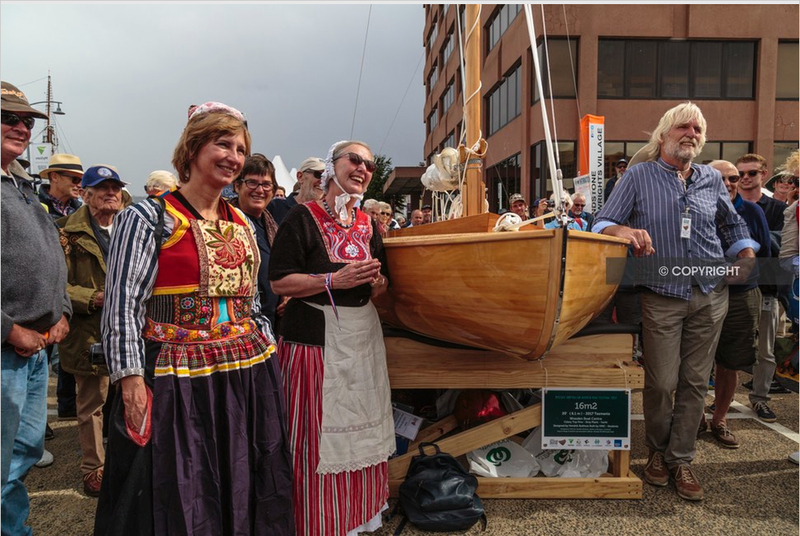 The project that built the Seacrest was a wonderful example of international cooperation and the community of wooden boats. 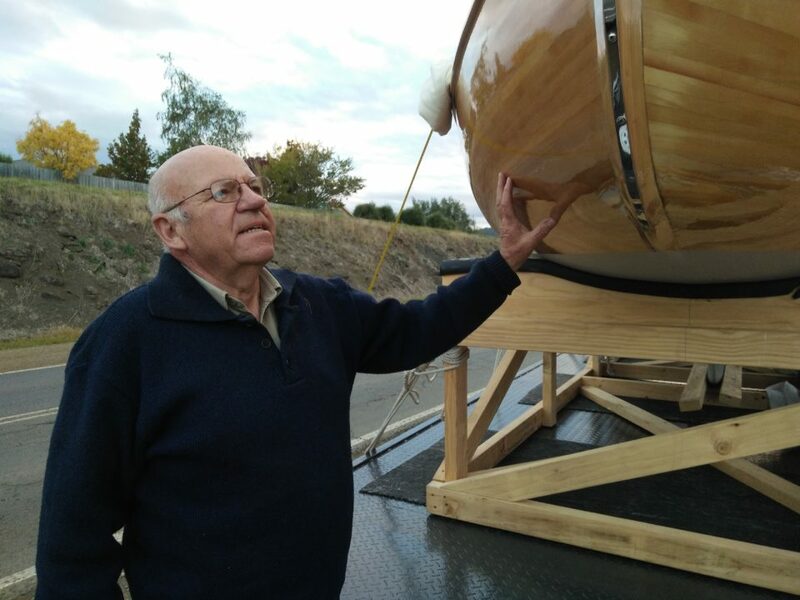 Gerhard Wilmink is a highly respected skipper and a repeat visitor to the Australian Wooden Boat Festival. His previous boat, the 50′ rock lobster boat Johanna Cherie, was built by renowned shipwright Gary Stewart at Port Fairy, Victoria. The Johanna Cherie is still in the industry, operating out of Currie on King Island. Gerhard and Cherie have become welcome friends in the community at Franklin, Tasmania. Many thanks to photographers Rob Oates, Daryl Peebles and Barbara Murphy for their contributions. There are many wonderful things about being associated with our organisation, and the MyState Australian Wooden Boat Festival. For me, one of the best things are the volunteers who contribute so much, and without whom we would not be what we are. Time and time again, I have seen hundreds of volunteers cheerfully and generously donate so much of their time and enthusiasm towards the success of our Festival, and to our organisation. As we go into the Festival, volunteer briefings are presented to hundreds of dedicated people, all determined to make the event a great success; and you only have to walk around the festival site during the event to see them all cheerfully at work, and yet thoroughly enjoying the occasion. Whilst, perhaps, I should not necessarily single out some individuals, I do want to make mention of Brian and Lyn Wilson, who have volunteered for the last nine Festivals. Brian and Lyn represented us on 16 May at the Hobart City Council, at a presentation ceremony at the Town Hall, where a Certificate of Appreciation was presented to our organisation. I think one of my earliest memories of Brian and Lyn was of them with our recently retired Treasurer, Peter Benson, in an unpleasantly hot office within the Festival site, furiously processing financial transactions and accounts, and calculating takings, in the days when we depended upon a gate for the financial success of our event. Whilst tens of thousands of people enjoyed the sun outside, Brian and Lyn worked untiringly in this room, throughout the Festival – arriving early each day, and not leaving until the work was done. So, to Brian and Lyn, on behalf of the Board, management and organisation of the Australian Wooden Boat Festival – a big thank you! It was very fitting that you should be at the presentation at the Town Hall, representing our wonderful volunteers! And, a big thank you to everybody else out there, who do so much to ensure the success of our organisation and the event. We could not do it without you. 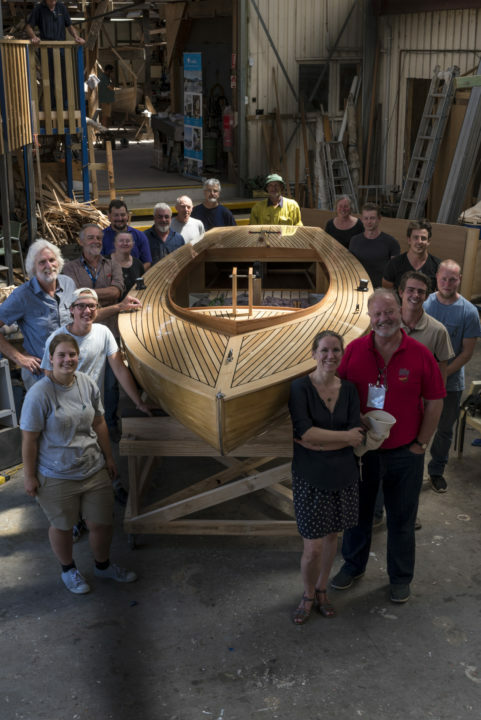 With apologies for the late despatch of our latest newsletter, here’s an update on progress towards the MyState Australian Wooden Boat Festival 2019. It’s been a hectic month, with all of us concentrating on a the functioning of the new website and the opening of the boat registrations in April and May. Like they say of a swan being stalked by a crocodile, it all looks smooth and calm on the surface, but there’s an awful lot of frantic paddling going on underneath. Making websites that are appealing, easy to use and informative requires tremendous effort from a whole team of people. Bronnie Hansson is always on the front line, usually receiving notice first if something has broken down, fails to do what it’s supposed to do, or is preventing someone from getting their application in. Bronnie is an expert at troubleshooting complicated electronic systems, soothing cranky callers and gently helping those for whom computers are still a bit of a challenge, all at the same time. Tech master Eftithios ‘Effy’ Stavros is in and out of the office almost daily, fixing settings and systems that none of the rest of us even begin to understand. Tim Oxley has been patiently helping out, while dealing with his own responsibilities, lining up our festival exhibitors for the Maritime Marketplace and across the site. Business is brisk, Tim tells us, with more than 30 exhibitors already booked, eight months before the event. Web designer Sean Ravenwood has put in hours of behind-the-scenes effort to make the new website look great and work smoothly (while also handling the strain of a soon-to-be father!) Our America cousins have been busy, too, and the line-up of boats, presenters, speakers and friends has become quite amazing. There’s a great deal of effort and enthusiasm going into the planning and we are looking forward to a wonderful show. Meanwhile, we are frighteningly close to the very ambitious four-day Australian Antarctic Festival, from 2-5 August on the Hobart waterfront. AWBF is acting as the production company for this event, which will see thousands of people experience Antarctica up close and personal at Princes Wharf and other sites around town. The Antarctic Festival program will be published this week on the website antarcticfestival.com.au and there’s something there for everyone. You can tour an Antarctic ship, see a huge exhibition in PW1 or enjoy the colourful ‘rookery’ of 7,000 painted penguins at the Mac 02 cruise terminal. If you are interested in becoming a volunteer at the Antarctic Festival, don’t hesitate – log on at the AAF Volunteers Page. You don’t need to know anything about Antarctica, but you certainly will by the time it’s all over!